This weekend, I ran my 10th full Three Days of Syllamo stage race in the Arkansas Ozarks. This is where you wonder how the weekend’ll go. This year's course was a scenic loop with a gorge overlook, moss-covered rock outcrops, wide stream crossings, and trails along the river. I usually run it hard to up the next day's challenge, but I contentedly spent the miles talking with friends and ran it way easier than usual. For once, I wasn’t itching to run fast the first day. No big deal. It left me in better shape for the next day anyway. Group dinner, shower, and in bed in time to get sleep before Saturday's early start. That’s what Steve, the RD, says every year at the 6am starting line while we're freezing there in the dark. This year's course was an out-and-back, great for seeing everyone at least once in the race. I couldn’t get today's new shoes tied right, and started last. That’s ok, I love catching up, but by the time I started up the hill, there wasn’t a headlamp in sight. A mile or two in, I started passing runners as expected, but the shoe continued bothering me for the first 20 miles. Worse, my legs felt as dead as if I’d burned through Friday’s 50k, when I’d done the opposite. I ran with more friends but we had to start worrying about cutoff, which I don’t usually do. At an aid station 20 miles from the finish, I took off to catch another friend ahead of me. I worked hard - I could bluff my way through tomorrow’s run - and I still wanted a strong run today. I knew I could catch her but despite all my work, I couldn’t. No zip either of the first two days. What was going on? Group dinner and hanging out, then shower and in bed for sleep before tomorrow’s stage. I needed it - I was tired. This is where you wonder if your legs will work. Today's course is always a lollipop that switches direction every year. I knew the course. Steve started us off and a wave of runners drifted by and away from me. I was running hard but it felt like I was standing still. It always takes me a mile or two to warm up on Day 3 but after two slow days, more slow was frustrating. I passed a few runners to catch up with two friends and we climbed the trail up the side of the gorge in the sunshine. As we talked, I worried about the slow running. Age? No, I refused jumping to that. Lack of training? Could be. I’ve been juggling a lot lately. Food? Hydration? Maybe, maybe not. Nothing stuck out, and the weekend was almost over. We topped out at an overlook. From here, the trail rolled along the ridge for miles until we descended to the finish, so I decided to push it, just to see. I had hours of driving home after this, so might as well blow it out. And miraculously, my body responded. The rest of the run was strong. 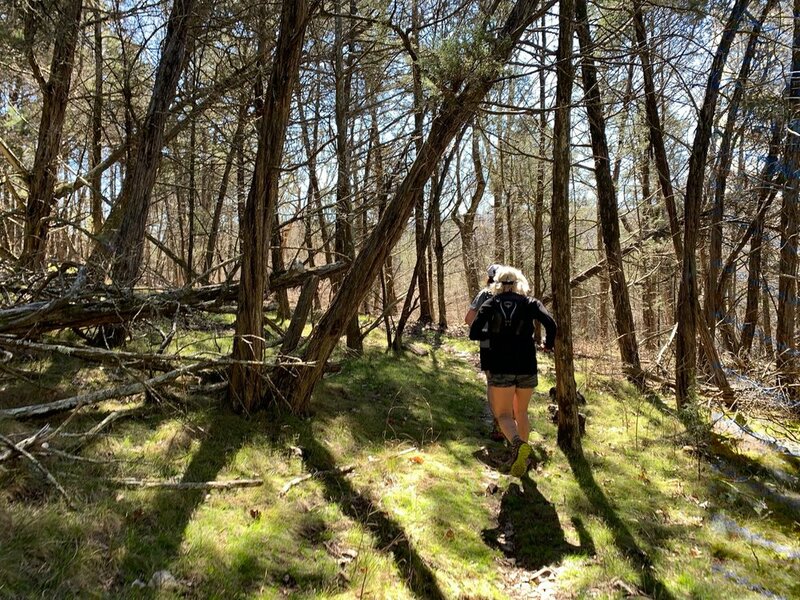 I ran almost every bit of it, ups and all, faster and faster, jumping over rocks like a kid again, grinning and having more fun with every mile. It felt so good! The best part? There was more in the tank. You can get in a funk, hit a plateau, lose fitness, or have a long unexplainable series of crappy runs for no obvious reason. It might go on long enough to seem like the new normal. It'll probably take some tries, a different day, or different circumstances to get past that low, but working through it is what gives you those magic times that flow. Life isn’t all magic unicorn days - it’s not supposed to be - and it’s the same with running. Because the blah, frustrating days pay for the glorious ones to come.